The Noosa festival is over and after a few lazy days I’m feeling back to normal. I was completely exhausted by the end, having surfed so much over the past few weeks and in need of a little time out of the water. The first event I entered was with my lovely friends, Gracie, Elsie and Emilie. We entered the Team challenge as The Euro ladies and did pretty well in the 2ft of clean surf – though unfortunately not quite enough to see us through to the next round. The tag team was fun, but actually way more stressful that I had anticipated. In the morning we had to listen to the rules. Having never surfed in a tag team event we were all pretty clueless to what we needed to do. It went like this – the heat was 40 minutes long, inside which our 4 surfers had to catch 2 waves each, return to shore, run (our least favourite bit) and tag the next person. Also, each person was only allowed 2 scoring waves, of which we had to claim by putting our hands in the air. No Claim – No Score. You were allowed a maximum of 3 waves each with only 2 waves which you claimed being scored. We had one ‘power surfer’ who was scored on 3 rides. We designated Emilie for this job she’d just arrived fresh from Sydney and the wave here more favourable that us because it’s on her forehand. Within that 40 minutes all four of us had to do the long paddle outback, ride our scoring waves and return to the top of the beach to tag our next member. I was the first to go, stood on the starting line with a load of blokes. Naturally they are super competitive and I didn’t want to be the typical lame girl and the last one out there. I put my head down and actually beat most of the guys out there, also managing to pick up a couple good waves and be the first to return to the beach to tag our next surfer. It worked out as 10 minutes each to get out surfing done which left the blood pumping and the heart racing! Unfortunately it was a close round and we missed out on progressing through on the most marginal of scores. We aptly re-named our team the Euro Losers ….this was just the start! 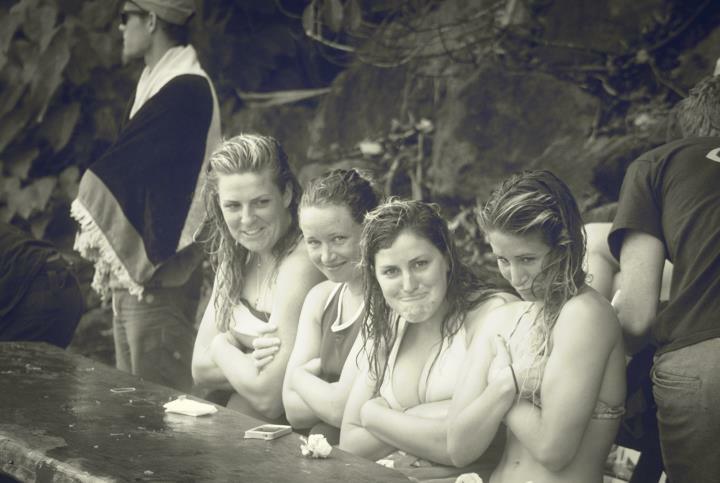 The Euro Ladies…..soon became the Euro Losers. We were trying not to giggle! The next event was a couple days later. My first event was the Women’s Pro. Taking and early lead, the waves were great but hard to find on a bouncy high tide. Bombed out in the first round, though was pleased with the waves I surfed and had some descent scores on the board. It was one of those situations where I had a great first wave and just needed a better back up score. Incredibly frustrating! 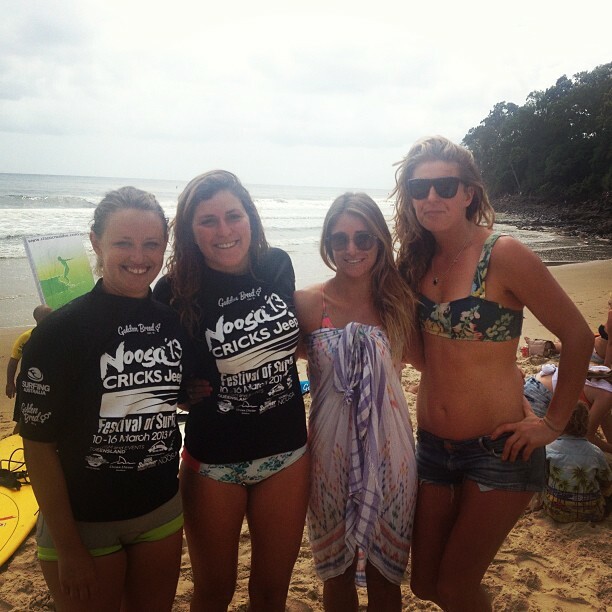 In the Womens open I surfed a few heats in tricky conditions on the dumpy low tide and the lumpy high tide. I swear the last heat I surfed before getting knocked out was more like an ironman event that a surfing competition. My already broken arms were certainly not liking all the paddling! Whilst I didn’t do as well as previous years I have certainly been lucky to surf some great waves at Noosa First point with just a handful of other surfers in fantastic conditions…..looking forward to coming back next year! ← Ellia and her New Surfboard!